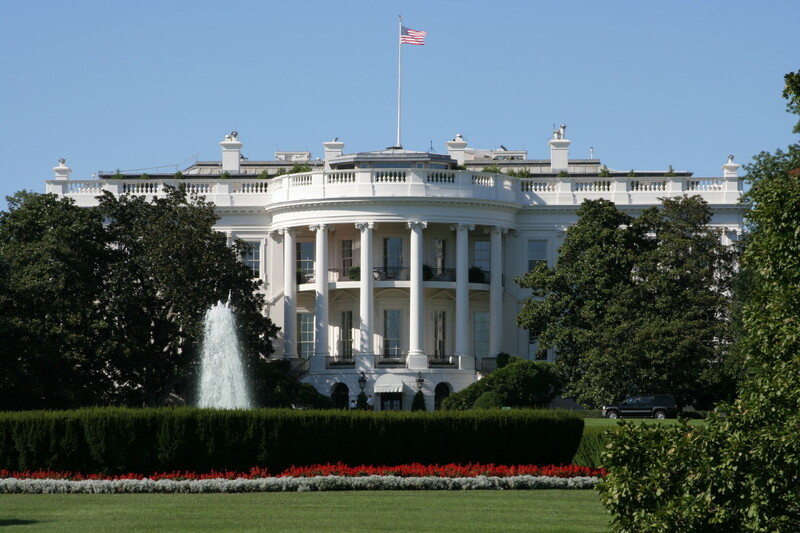 Who Doesn't Want to Visit the White House? Apparently the people organizing one of the most important events in education. Educators, students and parents are gathering in DC this weekend as part of the Save Our Schools March. This national call to action apparently did not involve meeting with White House officials. Props to event organizers for making a statement by not meeting before the march. Too bad it takes a national march to make reform leaders listen and then they only do so to maybe cash in a PR. Maybe they should read the TU more often. David Sirota penned something I read the other day that signaled the arrival of something I knew was coming. I doubt I am alone but I don't see many folks in the summer and reactions often take time to come in. High Stakes Test Mongers may finally have donned the water skis, that stupid life ring thing around their waists and jumped the shark. That phrase is an underused cultural reference but one we here at TU are very fond of. Henry Winkler would roll over in his grave if he saw this headline. What...? He's still alive? Well that's good news. But it just bolsters my point. At what point do the reforms involving more testing lose momentum and do more harm then good in an effort to revive support? Winkler's career moves on without Fonzie and let's hope our reforms will be the same. It took Happy Days 10 years to run out of steam and I can only hope a similar fate for all this test driven reform. My daughter is four. I know what four year olds are like. High stakes for her is whether or not we get a treat before she goes to bed or gets to watch a kids show after breakfast while Mom and dad get ready. I can only imagine her performance on any test might be connected to whether or not she got to listen to "I like to Move it, Move it" on the way to said test. Four year olds get tested for scoliosis and lice...not in academics. Argh! Sirota convincingly points out the flaws with a testing heavy approach to reform and skillfully uses Finland as a model of success. A worthwhile read. Finland has problems too, ....uh...well it is really cold much of the year in Finland. And they likely have several people that can't read even though everywhere I see has their literacy rate at 100%. Seriously though comparisons such as this lose some of their teeth when one considers the multitude of factors that affect education. It might still be worthwhile to try and learn from each other in order to improve but rankings and comparisons used for motivation? I can't say that makes much sense. There is a new film on the subject. The Finland Phenomenon which no doubt presents a more in depth look at what makes Finland's educational system tick. It's not testing. What we need here is a trusted social or cultural figure to stand up, say no, and inject some insanity to all this craziness. Someone as iconic as Richie Cunningham. Wait... who was driving that boat? Who? Seriously? So what you are saying is while it was Fonizie's who jumped that shark, Richie, actually helped by driving the boat? Man what is the world coming to? I'll tell you...a place where someone actually thinks giving four year olds important tests is a good idea. Teaching Underground goes Underground, literally. I did something I don't do enough of the other day and decided to take a day trip with my 4 year old daughter. While pondering several destinations, ones I'd like, ones she'd like, my daughter remarked she wanted to go somewhere cool. I am not certain what she meant but since it was hot as a Nick Lachay boy band outside I thought she might be referring to the temperature. Several days passed and while reading "We're Going on Bear Hunt" to her for the 1300th time it came to me. I'd take her to a cave. The chosen spot was near where I often fish in the heart of the Shenandoah Valley. It is called Grand Caverns(Weyers Cave to some) and it is tucked away in Grottoes about 45 minutes drive from our house. 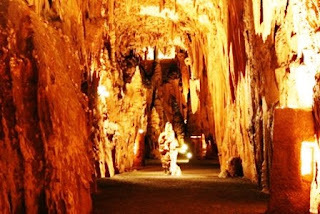 Grottoes, (Italian for cave) is a splendid little place and the town now owns and operates what is America's oldest show cave. Grand Caverns was discovered in 1804 by a man named Bernard Weyer while he was looking for one of his animal traps, presumably taken into the opening by an animal. What he found is truly amazing and inspired a sense of wonder and awe in both my daughter and myself. We arrived at about 11 AM and there were only 2 cars in the lot. The warm nature of the cashier at the store where you buy the tickets was a good start and once we bought our tickets he said the next tour started in 20 minutes. We passed the time with the penny crushing machine in the gift shop and then climbed "Cave hill" to the entrance. That irony wasn't lost on my 4 year old who complained about the trek and having to carry a sweatshirt along for seemingly no reason. It was there where we met our guide, a local who was well versed in the history and geology of the area. She headed the line of 7 visitors on our careful descent into the cool darkness below. The age in our group ranged from my 4 year old to an older couple from Phoenix. Talk about differentiation! At the front was this individual who quickly showed she was a master of her craft. She managed to hold our attention with a mix of talents. The volume and range of what she shared with us was impressive and wide ranging. I guess I have a peculiar kinship given I also teach underground. I can only hope to do half as good a job. When I venture to a "destination" I often prefer to do my own thing and focus only on what interests me. That mentality seems analogous to what many students feel when they think about school. Thinking back I can learn much from this person who literally works underground in the dark. She did talk most of the time but paused to ask questions and seek input, giving us sufficient time to just absorb all we were seeing. Just before the tour she skillfully took a few moments to learn a little about each of us and then catered to our interests and connect us to what we were learning. She engaged personally with us all and managed to make each of us feel important. She threw in some inquiry based learning and started with some rooms simply by asking questions. I got 2 correct. My daughter got 3. All told we were in the 54 degree cavern for more than an hour and 15 minutes and walked more than a mile and a half. But man, we took in a lot of information. Topics ranged from stories of George Washington and Thomas Jefferson and underground parties, to descriptions of the eons of growth and geologic oddities. We got much more than the cookie cutter version that most big groups likely get when pressed for time. We even saw "George's ghost" seen here at the center of "cathedral hall". The Civil War is woven into the fabric of the Valley's history and that is no different below ground. Within sight of Cave Hill were 2 engagements where more than 3,000 soldiers died. But in the Cave things were somewhat different. Evidence suggests Union and Confederate soldiers visited at the same time, sort of leaving the war on the outside. I wish that could be the same today and especially that we could set aside our differences for the greater good of those in our schools. I guess in some ways we have always done this in schools but it is seems too infrequent in an increasingly vitriolic debate on the future of education. During the war more than 200 Civil War soldiers visited the cave and left signatures. This graffiti would be frowned upon and illegal today but it opened a snapshot into one story in particular. The tale of Captain William Miles(seen here as W W Miles) from Pennsylvania who was later killed in an engagement with the famed Gray Ghost John Mosby. So the literal "journey" we took below ground might have some metaphorical comparisons to what happens in a school. It takes time to grow rocks and a single touch can stop this process permanently. Similarly the maturation and education of a child can be equally fragile. Any missteps along they way leave marks hard to overcome. Exterior factors such as poverty, teacher turnover, national policy and shifting curriculum impact children just as the subterranean world is subject to shifts beyond their walls. Taken individually these formations might seem unimpressive, like hearing only one note in a song. But in concert they contribute to something wondrous. I think reflecting on people who enter our schools as students and teachers only as individuals leads to the same conclusion. I would be remiss if I didn't mention Plato's Allegory of the cave from the Republic which I have found to be one of the most rewarding lessons I use with my kids. Symbolic indeed. One could find many more parallels between this cave and education. You could have given me a map, tour book, and weeks to prepare outside the cave but that would be no substitute for the knowledge and experience of a seasoned guide. Maybe teachers are the same. A digital snapshot from inside the cave does little to convey what it is really like to someone who hasn't experienced it themselves. Still decisions are made far from the classroom and often because there is political momentum to do something, even if it is the wrong thing. I had been in caves but it had been some two decades and perhaps this is similar to those that have left the classroom. They think they remember what it's like but they do not. As a general rule caves are thought of by most people as uninviting inhospitable places but those are misplaced perceptions. I think how the public understands schools can be characterized the same way. Many folks know the basics about caves. The stalactite, stalagmite... but we went much deeper(pun intended) learning of the amazing abundance of shields there, the cave coral, and ancient tectonic processes that folded the Earth's crust turning horizontal rock into vertical. Anything worthwhile takes time. If we are to strengthen and improve our schools our progress should be measured and cautious. Going in too fast might take us somewhere we might not want to be, with no way to reverse course. An unwise cave explorer might then bear some resemblance to those calling for drastic reform and quick fixes. Trying to describe what we saw in the cave is likely much like explaining the impact of reform to those that do not work directly with kids. People have toured the cave for 205 years and much has changed with the experience, as is the case in our education system in this country. They graduated from using candles and torches to flashlights and electric bulbs. But what they felt and what we felt were probably the same at their heart. Teaching at the same school I attended gives me a desire to maintain some things about our school that shouldn't be altered but also move it forward in necessary ways. Seeing some shifts makes me uneasy as if someone in our group were touching a prized attraction. My daughter's favorite moment was when the guide took us back into a large side chamber and switched off all the lights. Transporting us to the days of old when explorers ventured by candlelight. This afforded us a look at something you can't see with electric illumination. The crystalline walls of the cave sparkled like diamonds as the candle flickered and for the next few moments we just stood in silence and wonder taking it in. Our tour ended when we ascended up back into the humidity and heat. 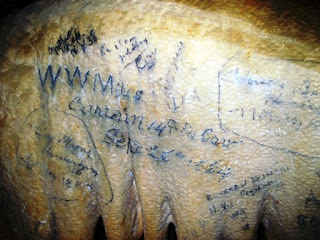 We signed the guestbook and thanked our guide for our amazing journey. My daughter gave her leg a hug and said thank you and quickly scurried towards the door dragging my hand behind. But she quipped, "Dad it was really cool in there". I hope that sense of wonder will show up again on some other adventure we take. It'll be a tough act to follow. Maybe I shouldn't worry so much about outdoing this day and just tuck it away in my memory. I haven't touched base with my Teaching Underground partner too much this summer break so far, but before the last day of school, we struggled a little trying to figure out what the Teaching Underground would look like over the break. The online community is fickle. We've noticed that a catchy title will generate traffic and a reference to something popular (new Harry Potter movie) can boost visits. Mostly, we find that when we add meaningful content regularly, more than once a week, we have a pretty strong following. When the posting comes more sporadically, the obvious occurs. I find it hard to stay relevant to the online community. Creating something meaningful that only lives for 2 to 7 days before becoming stale is difficult and sometimes discouraging. Especially when you're engaged in a career in which you hope that your impact will last a lifetime. I find it easy to post during the school year when my schedule is fixed and predictable. But my summers are anything but that. My last week was spent with over twenty teenagers serving a community three hours away. We lived together and spent our days running a day camp for children and fixing up homes in the neighborhood. I strengthened relationships with teenagers that I work with regularly in our church and created new relationships with people in the community we served. I didn't have time to write because every minute of my day was spent interacting with others. That's what most of my summer will look like. I will be away from my home, away from a reliable internet connection, often disconnected from the world of news and information for days at a time. I don't feel irrelevant because of that. If anything, I think that sometimes we mistake relevance as understanding the big picture. If we worry to much about the big picture it is easy to forsake the smaller world that we move about in every day. I'm not sure if this fits in so well with the theme here at TU, but I think that as a teacher, it might be one of the more important lessons to remember. We may not be celebrated on the front cover of magazines. We're likely to be the last voice interviewed on the six o'clock news. Not many of us have a national platform or get called to the big speaking gigs. Honestly, if we are, we just might be worried so much about being relevant that we forget to be relevant to the people that matter the most-- the ones within our eyesight and earshot day in and day out. As the "War on Our Schools" wages on the body blows are starting to take their toll. I try to avoid buying into the idea that someone is out to get us, but my ribs are pretty sore. Almost daily I have a conversation with a colleague whose ribs feel much the same. Certainly I can dismiss some of the concerns as alarmist or just complaining, but they have become so frequent that they are tough to ignore. Many good teachers are starting to leave. I'm a little worried that the current economic climate overshadows this and covers it up so no one notices. Is anyone paying attention? As our nation looks in the mirror and asks itself some pretty important questions about the future one of those is what should our schools look like? I ask that with my knowledge as a teacher who just tries to get a little better each year. Sometimes I am successful, sometimes I am not. I try to do the job I would want done for my own children. But that feels like it keeps getting harder and this is a reflection of a system that I think is not getting better each year despite flurried reform. To the person not working in the schools they hear political rhetoric calling for reform and improvement and generally welcome the idea. These seem innocuous enough and garner sufficient support to move forward or are introduced quietly enough to go unnoticed. These reforms are creating a system that drains resources from actual instruction and are impossible to maintain. They march forward unopposed until they reach the schoolhouse. By the time we at the ground level confront what their effect is on student learning and our teaching it is too late to stem the tide. Its like when a boxer plans to come on in the late rounds but the body blows took us out before we could do much about it. Granting the point that education has problems and we need to work hard to improve and make some changes allow me to pose another question to that mirror. What if the decisions being made are wrong? Value Added, Race to the Top, International Comparisons, the list goes on. 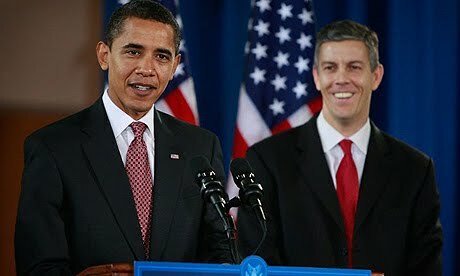 Arne Duncan(yes picking on him) and others might be doing something that no one is asking for, at least publicly. Destroying our Public Education system as we know it. Don't believe me? You're not alone. I think that our schools should be viewed as too big to fail and there are countless teachers that say current decisions are steering us in that direction. But no one is paying attention. There is a big difference between not serving all kids as we should and not serving any kids as we should. Ask this of top reformers and see what they respond: What have your policies done to improve our current state? Usually they'll just verbally dance around and try to appeal to their audience. What they won't say- we think we are spending too much on education, we don't support public schools, teachers are professionals, other factors affect learning, poor children have a tougher time keeping up and we should do something about poverty, standardized testing is unreliable, our teachers are overworked, rating tests are different from ranking tests, we don't know if this works, this is popular so that's why we are doing it. Pay attention when private companies convince you they can do a better job with public tax dollars. Pay attention when Bill Gates, Oprah or some other billionaire gains influence over education policy solely because of their wealth(they seem to pay for attention). Pay attention when the politicians say their schools are failing but don't say specifically why or blame anyone or anything else in the community besides the school itself. Pay attention when school leaders start making claims about success based on their leadership. Pay attention when exhausted teachers leave the job citing shifts in what they are being asked to do. Pay attention when no one in the upper echelons of the educational establishment is willing to do anything except support the latest and greatest idea to come from the private sector. Pay attention when your child comes home and says their teachers complain about how testing affects them. Pay attention when your local school district makes a change driven by top down reform. Pay attention to anything labeled as "data driven decisions". We as a nation simply need to do what we ask of our kids each day, pay attention.